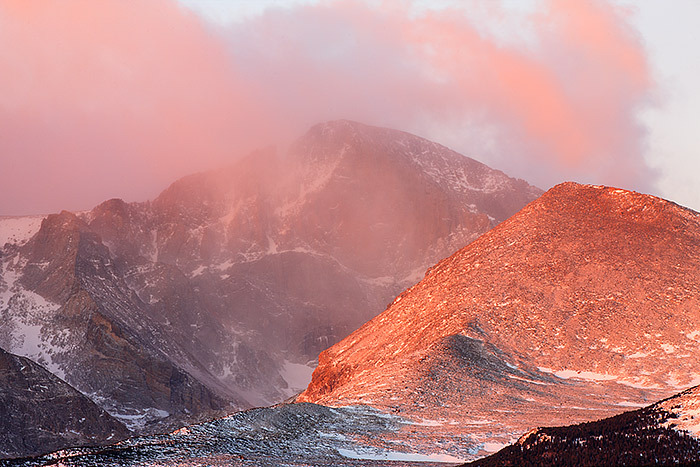 Sunrise unfolds over 14,259 ft Longs Peak. Winters full force can be seen in this image as the summit of Rocky Mountain National Park's highest peak is battered by snow and high winds. The early morning sun illuminates The Diamond on Longs Peak's east face. This view is from the flanks of the Twin Sisters were conditions were cold and windy, but certainly more pleasant than it would be on the summit of Longs this morning. Photo © copyright by Thomas Mangan.